Once again, several people clamored for an explanation, all at once. “Then Great Mr. Mo is really making a great mistake. Isn’t he weakening the power of his own Hengshan Sword School by forcing Master Liu to renounce the Martial World?” someone else asked. “How can one man figure everything out? All I want is to be the Head Master of the Sword School without challenge. Who the hell cares if the power is more or less?” the middle-aged man in silk sneered in imitation of Great Mr. Mo. Before he could finish his sentence, someone near the door struck some chords on a huqin,25 and someone began to sing, “The poor Yang Family, showed great loyalty, protected…the Song Government….” The words were drawn out and sounded quite melancholic. Everybody turned around to look, and saw an old, tall, thin man sitting next to a table. His face looked haggard, and he was dressed in a long blue robe. The robe had been washed so many times that some parts looked more white than blue, making him look quite decrepit. He was obviously some kind of a begging performer. “Hey, buddy, you were just talking about all the schools and clans having sent people, so what about the Hengshan Sword School, itself?” someone asked. “The apprentices of Master Liu are greeting guests all over Hengshan town, but other than Master Liu’s apprentices, have you seen any other apprentices from Hengshan Sword School?” the short fat man continued. Hey, brother, you are a projectile expert! That throw was most excellent!” the short fat man exclaimed in praise. “How could he show up? The relationship between Great Mr. Mo and Master Liu is like that of water and fire. They’d start a fight the minute they saw each other. Master Liu has already given ground. Great Mr. Mo should be satisfied,” the short fat man said. 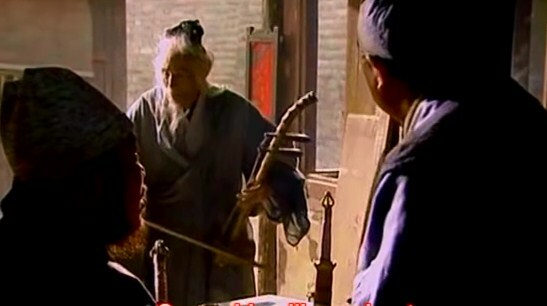 The old huqin player stood up suddenly, and walked slowly in front of the short fat man. He looked him up and down. “What do you want, old man?” the short fat man demanded in annoyance. “You are talking nonsense!” The old man shook his head then turned around and walked away.